Our dentists specialise in teeth whitening to give you a healthy, clean, happy smile. Everyone deserves to have a beautiful smile. Sometimes though, life gets in the way and our teeth can become stained and discoloured no matter how well we brush and floss them. With Zoom Teeth Whitening you can achieve healthy, white teeth in less than an hour with a single visit to a dentist from Smile Place Dental. Zoom is a safe and effective treatment that has restored the smiles of over 10 million people around the world. Best of all, it is pain-free. The Zoom series of teeth whitening products offers a variety of in-chair and take-home whitening options, such as Zoom WhiteSpeed, Zoom DayWhite and Zoom NiteWhite, so it is suitable for every lifestyle. What’s more, Zoom products achieve better whitening results than many other whitening products because they use light-activated technology. In fact, using Zoom products your smile could become up to 8 shades whiter in just 45 minutes – it’s clinically proven! Don’t waste time and money on inferior technology. Zoom’s light-activated whitening technology has been shown to be 40% more effective than non-light-activated systems so choosing Zoom really is a great investment. But don’t think that Zoom will just give you whiter teeth – all Zoom treatments will enhance the lustre of your smile while also protecting your tooth enamel so you can rest assured that your Zoom treatment won’t damage your teeth like some whitening treatments can. When you choose to use Zoom Teeth Whitening through a dentist from Smile Place Dental, we will carefully protect your gums with a specially designed covering. One of our dentists will then apply the Zoom whitening gel, which will immediately start breaking down the compounds that are staining your teeth. To speed up your whitening procedure, your dentist will then ‘activate’ the gel using the Zoom WhiteSpeed Whitening LED Accelerator. 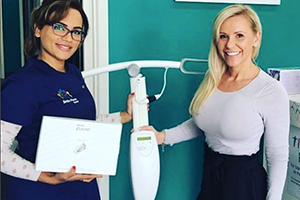 When you choose Zoom Teeth Whitening, not only will you get a healthier, whiter smile without the use of needles, if you have sensitive teeth, they will be further protected from pain thanks to the inclusion of amorphous calcium phosphate – a compound that is clinically proven to reduce tooth sensitivity. No other whitening product contains this compound so Zoom is a particularly good choice if you suffer from sensitive teeth. Many teeth whitening products will damage your teeth over time or provide you with uneven whitening coverage. When you choose a Zoom Teeth Whitening treatment and have it administered by one of our experienced dentists, you can rest assured that the treatment will give you a uniformly brighter, whiter smile while protecting your teeth and gums. So don’t put it off any longer – call Smile Place Dental for a booking today and experience for yourself the wondering difference a Zoom Teeth Whitening treatment can make to your smile.